In this video I will be exposing the Illuminati Card Game, and showing you just the predictive programming/mental psy-op behind all this. Because the TRUTH is much stranger than fiction! YOU are living in a fantasy!!!! In this video I will be exposing the Illuminati Card Game, and showing you just the predictive programming/mental psy-op behind all this. Because the TRUTH is much stranger than fiction! YOU are living in a fantasy!!!! In 1982, a man by the name of Steve Jackson distributed these cards in the Illuminati card game set. During the 80s and 90s, more cards were added to the game, and were subsequently used for play. 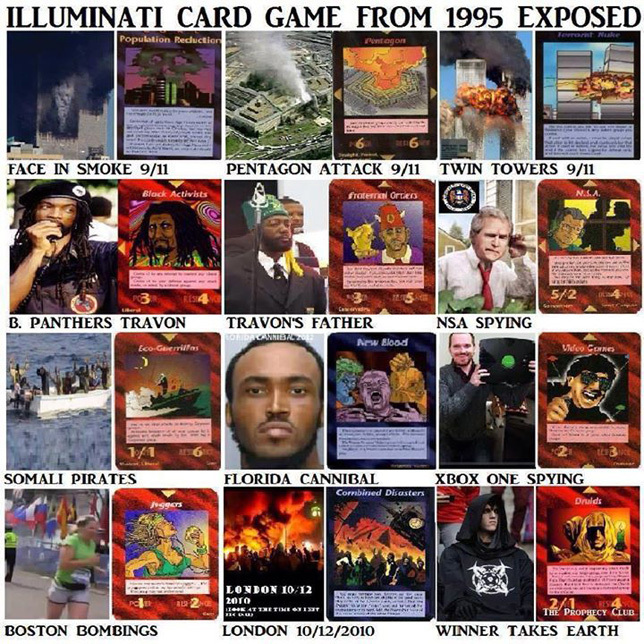 But when you examine these cards more closely, you start to see just the eerie symbolism, and how these cards “just so happened” to “predict” future major events: events including 9/11, The Pentagon, Fukushima, The 2010 BP Oil Spill, The Obama Presidency, Saddam Hussein, Paris, The Boston “Bombings,” and much more! I implore you to research more on these cards in your own spare time (if you already haven’t), but if you would like me to do a follow-up video on this, PLEASE LET ME KNOW!!! Do the elite know something we don’t? Do these cards happen to predict even more events on the horizon? If so, WHAT are those events?